One of the most beautiful, exciting, unspoiled, calm and quiet hillock situated just a 45 minute trek from our resort. The hill station is 4500 ft. above sea level and is surrounded on all sides by valleys and hills. To reach the peak of this tourist spot, 6 kms of walking through an extensive nature reserve dense forest is a must. At the bottom of this hill there lies the Ezharakundu waterfall and river. 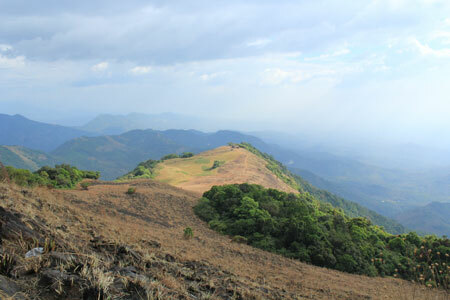 The hill is rich in flora and fauna and has umpteen species of rare birds and wild animals including elephants. Watch sunset from the hill top and get ready to climb down duly engulfed with the fog. Really, a thrilling experience mere word cannot fully express. A long, quiet and clean beach, famous for its flat laterite cliffs that jut into the sea. The landscaped sculpture of ‘Mother and Child’ in the well laid garden is an added attraction to the beach. It often finds mention in tourism related publications as a beautiful beach and is just 2 km from Kannur town. The most reliable place for ayurvedic treatment for all ailments – the cradle of umpteen colourful folk arts, Martial arts and music – the land of many ancient temples and churches. 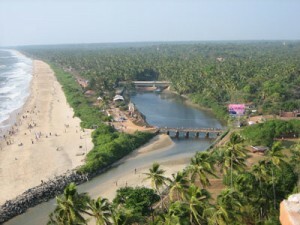 Formerly known as Cannanore, Kannur is the largest city of the North Malabar region. Visit Parassinikkadavu Muthappan Temple. Watch theyyam, Kalaripayattu, Kathakali, Thayambaka etc. Local sight-seeing trips – Tribal villages, River beds, Paddy fields, Coconut farms, Rubber plantations etc. Attend Cooking Classes and practical for Kerala dishes like Payasam, Puttu, Appam etc. Attend Ayurveda Classes to understand in depth the various treatments and massages under the expertise guidance of a qualified Ayurvedic Doctor.